A young Liberian woman puts a flag of Liberia in her hair. The youth account for almost two-thirds of the country's population. As the United Nations peacekeeping mission wraps up in Liberia and the West African country looks to secure a stable future, the UN deputy chief on Friday cautioned the Government that while it has made great strides, the road ahead will be challenging. 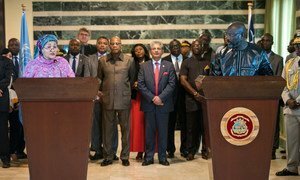 At the launch of the country’s new National Development Plan in the capital, Monrovia, Amina Mohammed, the UN Deputy Secretary-General, congratulated all Liberians on a hard-won peace after 15 conflict-torn years and the progress made during the subsequent post-war period. She, however, outlined that along with opportunities, serious challenges lie ahead. “When I look at the young women and men, and the initiatives for peace that they have courageously carried forward, sometimes even risking their lives, I am filled with pride and hope but also with fear,” said Ms. Mohammed, noting severe economic constricts in the country and high unemployment among its youth. “We cannot fail them. We must […] empower them, […] meet their needs and expectations, and help them to fulfil their dreams,” she added. Applauding the country’s new development framework, dubbed the Liberia Moment, Ms. Mohammed underlined five principles that must underpin the Plan. These include national ownership; eliminating poverty; improve tax and revenue collection, strengthen rule of law, and end dependency on aid; enhance transparency; and ensure predictable and sustainable means for development financing. She also underscored the need to consolidate peace and avid a relapse into conflict, and in doing so reiterated the importance of implementing the 2030 Agenda for Sustainable Development. “The Sustainable Development Goals (SDGs) are the best tools we have to prevent conflict and we should make every effort to achieve them without delay,” she said, noting that the UN stands ready to provide the Government with advice, expertise and support needed. “We will be with you every step of the way. This is our commitment,” said the Deputy Secretary-General. Liberia, went through two civil wars spanning over 14 years between 1989 and 2003. Civil war in Liberia claimed the lives of almost 250,000 people and led to a complete breakdown of law and order. The UN mission, known as UNMIL, was established by the UN Security Council in 2003 after a peace agreement was signed to end the fighting. The mission created a security environment that enabled more than a million refugees and displaced persons return to their homes; supported the holding of three presidential elections, and helped the government establish its authority throughout the whole country following years of fighting and instability. Meanwhile, as part of the closure of the UN Mission in Liberia (UNMIL), its official radio station, UNMIL Radio – which had been broadcasting since October 2003 to over 80 per cent of the country’s population – will transfer to Radio ECOWAS, the radio station operated by the Economic Community of West African States. As part of her visit to Liberia Amina Mohammed, United Nations Deputy Secretary-General, celebrated the successful closure of the UN mission there, which she said set the stage for sustained peace in the months and years ahead.